It seems like most conservation stories these days portray opposing sides battling it out in the public media and in the courts. We hear more about the battles than we do about Nature. While these issues are usually very important, I also like to read happy stories about successes in conservation. Good conservation needs teamwork and a strong community consensus. It is hard to measure success in conservation. I was delighted to find some positive things to write about in my recent blog on the holistic conservation methods employed by Holistic Management International HMI. Some of my dear readers questioned the effectiveness of the methods employed by HMI. From the comments I received, it now seems to me that “success” is the wrong word. Rather, I should have said “conservation progress”. With this blog post, however, I am convinced that I have a story for you that is a “conservation success”. I hope you agree. 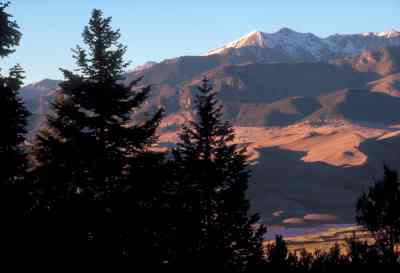 While this story looks like just another battle between human beings over their individual water rights, this case also involved the health and the future survival of the Great San Dunes National Park ecosystem in the San Luis Valley in Southern Colorado just northeast of Alamosa. 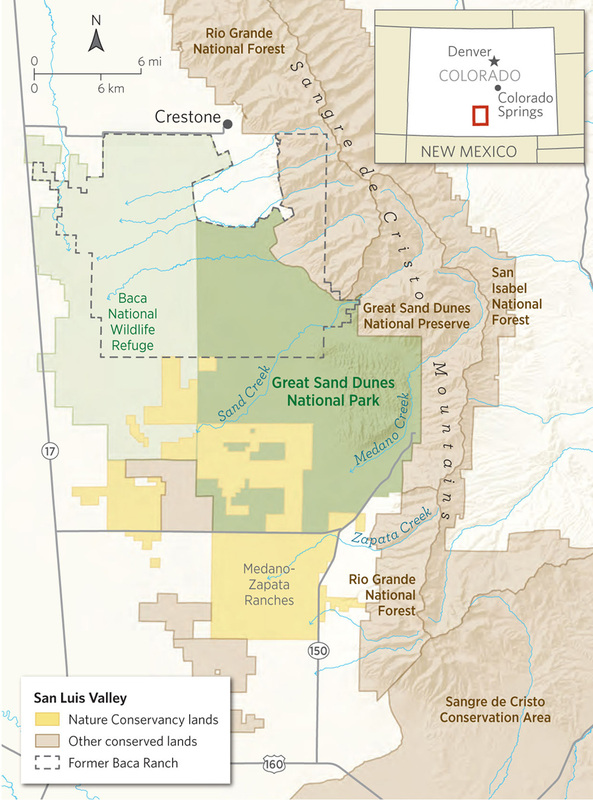 Commercial water interests in remote locations threatened to pump dry an aquifer that sustained the dunes and their ecosystems. 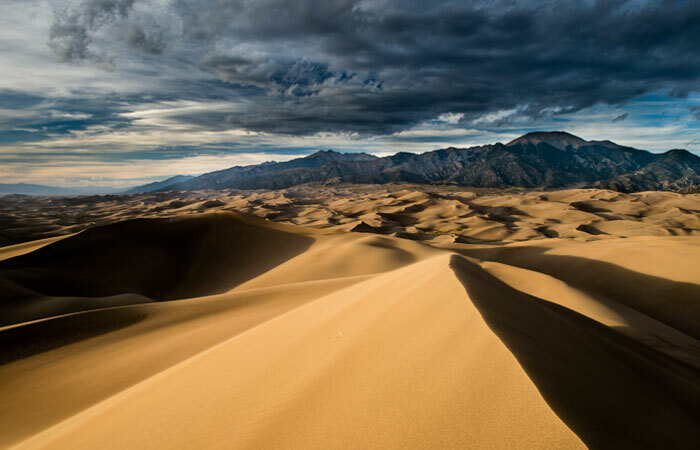 This is a wonderful story of Nature’s stewards who understood the inter-connectivity of the dune system and took action to preserve it. 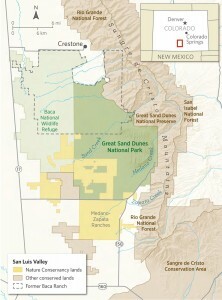 The Nature Conservancy published an article on this effort. The photographs shown in this post are from that article. If the water table were lowered, in addition to threatening other local ecosystems and creatures, the creeks that recycled sand back to the dune field would dry up. The “conveyor belt” would be lost. The participants in saving the aquifer were local residents; The Nature Conservancy; the federal Land and Water Conservation Fund; David and Lucile Packard Foundation; Colorado State Land Board; Great Outdoors Colorado Trust Fund; National Park Service; U.S. Bureau of Land Management; U. S. Fish and Wildlife Service, U.S. Forest Service, and other local, state and federal officials and non-government organizations. It was threats to these ecosystems that galvanized this locally-driven collaborative endeavor. The details of the effort can be read in the magazine article. Success came through the power of a committed community combined with good science offered by the professionals who were involved. In my opinion, this is a dynamite combination. I live in Guaymas, Sonora, Mexico where we are all very concerned about political interests destroying an important estuary that is an important flyway for migrating birds. Ecological threats caused by political interests have been met by a wonderfully strong consensus within the community coupled with a knowledgeable scientific team and the development of a management plan that will have the force of law. I have seen ecosystems under great threat in communities with split interests and no strong consensus. When this happens, the pathway to preserving the environment is much more difficult. As I get older and wiser, I’m beginning to realize that environmental groups and government agencies play an important part in the processes of restoring and preserving ecosystems in our environment. But, I’m also seeing that neither the environmental groups nor the government agencies will ultimately succeed without good teamwork and a strong community consensus. Heartening. I hope you will be able to relate a similar tale regarding the San Pedro River. I certainly hope that day will come when community consensus can be achieved. Thanks Bill. I’ve spent weeks camping and working in dune fields. There is a drawer full of data that my students and I collected 33 years ago that awaits a full analysis. I scooped your article. It’s at: http://www.scoop.it/t/ecoscifi if you want to see it. Thanks Garry. I greatly appreciate the “plug”. I’m sure my readers will be interested in seeing the other articles you have placed in your “Scoop-It”. I just found another great story where community efforts blocked the taking of water from rural areas to supplant Las Vegas’ dwindling water reserve. Bill, Good post. I have been fortunate enough to be involved in some successful stakeholder consensus projects and they are wonderful to be a part of. I have also been unfortunate enough to have been involved is some disasters. In my experience it is all about good facilitators and openminded stakeholders. You said it well, George. I’ll be doing some more of these kind of blogs soon. I’m going to use your words, exactly.